As the NSW SES is a volunteer organisation, not all NSW SES Units are staffed during business hours. The best way to get in contact with your local unit is to contact the Zone Headquarters during business hours in the first instance. They will then provide you with the best contact details for your enquiry. Please click here to find your local Zone Headquarters. Of course you can. The NSW SES has four categories of volunteering designed to provide every community member with the opportunity to join the NSW SES, no matter what their personal circumstance may be. For Unit Volunteering, the application form provides a section for you to disclose any disabilities and your required adjustments to facilitate your request. Check out the other volunteer categories here, and submit an expression of interest for the category that best suits your circumstances. You can also contact your local Zone Headquarters here to find out if your local unit can facilitate your needs. “I have a criminal record. Can I still apply to be a volunteer?" Yes. The NSW SES does undertake National Police History Checks on Unit volunteer applications however, not all community members with a criminal record are declined. A qualified team member individually accesses each application and you will be advised about your application outcome accordingly. “Do I need to be an Australian citizen to volunteer with NSW SES?" Non-Australian citizens who hold a temporary visa can volunteer depending on the type of visa held. Generally speaking, if a person's visa allows them to do paid work, then they can volunteer. Click here for more information from Justice Connect. Visa holders can check their visa details and conditions online at the Department of Home Affairs VEVO website. Of course - the more people helping to protect our community the better. If you prefer to help out for surge capacity events rather than providing a regular volunteer commitment, then Spontaneous Volunteering is for you. 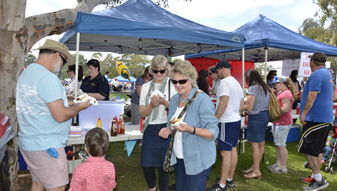 Spontaneous Volunteers are community members who volunteer in one-off events to support the NSW SES during emergencies. Spontaneous Volunteers work closely with the NSW SES and local communities before, during and after disasters. Explore your volunteer options further here. If you are no longer an active member, you must reapply to join the NSW SES through the online application process. All applications to join or rejoin as a Unit Volunteer require a new National Police History Check. Although some units can provide a FastTrack recruitment process, the NSW SES cannot expedite National Police History Checks, therefore we cannot ensure that your application will be faster. In addition, your details have to be linked to your previous record (service history, employee number), therefore, on some occasions, rejoining applications could take longer to process. Open Days are a great way to see what volunteering opportunities the NSW SES has in your area. As the NSW SES is a volunteer organisation, not all NSW SES Units are staffed during business hours. The best way to get in contact with your local unit is to contact the Zone Headquarters during business hours in the first instance. They will then provide you with the best contact details for your query. Please click here to find your local Region Headquarters. There is a 21 day processing period from the date you submit your application to the time you receive notification about your application. Only after this time can we investigate the tracking of your application. If you have not received any contact from the NSW SES after the 21 day period has lapsed, please contact your local Zone Headquarters to find out what stage your application is up to. Yes. This can be discussed with the Unit at the time of your initial interview. The unit can reassign your application to the Unit of choice prior to submitting their recommendation. Yes. If a staff member joins as a volunteer, or a volunteer becomes a staff member, a second member number will be issued. The accounts are separate however qualifications and contact details are linked. "Can I join if I am under the age of 18?" Volunteers can join the NSW SES at ages 16 and 17 but must complete a Parent and Guardian Consent form at the time of joining. Volunteers aged under 18 can still participate in most NSW SES activities but cannot attend road crash rescue incidents.